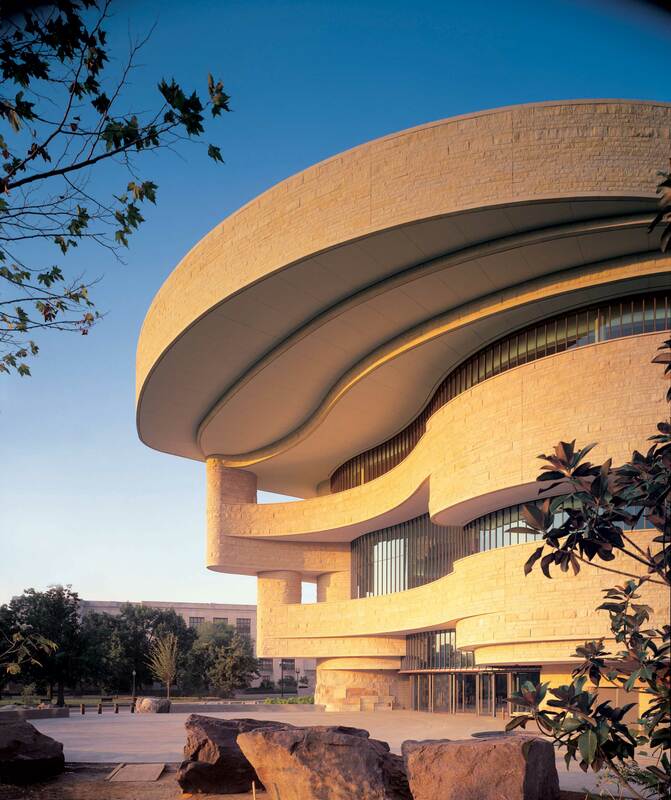 The Smithsonian’s National Museum of the American Indian opened its doors to the public Sept. 21, 2004. The museum, which was 15 years in the making, is the first national museum in the country dedicated exclusively to Native Americans, the first to present all exhibitions from a Native viewpoint and the first constructed on the National Mall since 1987. The five-story, 441,000-square-foot, curvilinear building was built on one of the last open spaces available on the National Mall, located between the Smithsonian’s National Air and Space Museum and the U.S. Capitol. The textured golden-colored Kasota limestone exterior evokes natural rock formations formed by wind and water through time. Set in a 4.25-acre landscaped site with wetlands and 40 boulders known as “grandfather rocks,” the museum is a sharp contrast to neighboring Washington buildings. Its special features—an entrance facing east toward the morning sun, a window with eight prisms and a 120-foot-high spaced called the Potomac Atrium—were designed in consultation with many Native Americans during a four-year period. The Lelawi (leh-LAH-wee) Theater, a 120-seat circular theater located on the fourth level presents a 13-minute multimedia experience titled “Who We Are” to prepare museum-goers for their visit and conveys the significant presence and diversity of Native peoples throughout the Americas. “Our Universes: Traditional Knowledge Shapes Our World”—focuses on Native cosmologies and the spiritual relationship between mankind and the natural world. It explores annual ceremonies including the annual Denver March Powwow, the North American Indigenous Games in Canada and the Day of the Dead in Mexico, as seasonal celebrations that unite different Native peoples. “Window on the Collections: Many Hands, Many Voices”—offers a view into the vast collections of the museum by showcasing objects arranged in several categories. Objects include animal-themed figurines and objects, beadwork, containers, dolls, traditional games and toys. Throughout the museum, the works of Native artists are on display as “landmark objects” in the public areas, including a 20-foot totem pole by carver Nathan Jackson (Tlingit) and a bronze sculpture by Roxanne Swentzell (Santa Clara Pueblo). The George Gustav Heye Center opened in 1994 in the historic Alexander Hamilton U.S. Custom House in lower Manhattan. The museum features year-round exhibitions, dance and music performances, children’s workshops, family and school programs, film festivals and video screenings that present the diversity of the Native peoples of the Americas and the strength of their cultures from the earliest times to the present. There were 584,000 visitors to the Heye Center in 2014. The Cultural Resources Center, a research and collections facility in Suitland, Md., includes conservation laboratories and space for photography, film, video and collections management; private indoor and outdoor ceremonial spaces for the traditional care and cultural use of the collection by appropriate individuals and tribal groups; an information resource center; a library; and offices and workrooms for curatorial, cultural resources, repatriation, community services and administrative staff. The National Museum of the American Indian hosts a variety of free cultural arts programs, including Native music and dance performances, theater, films, arts and crafts demonstrations, symposia and more. For a schedule of upcoming programs, visit www.AmericanIndian.si.edu and select “Events” or stop by the Welcome Desk. (mit-seh-TOM), meaning, “let’s eat,” is taken from the native Piscataway and Delaware languages. The Mitsitam Cafe features menus from five geographic regions covering the entire Western Hemisphere: Northern Woodlands, South America, Northwest Coast, Meso America and Great Plains. The Zagat-rated Mitsitam Cafe is open daily from 11 a.m. to 5 p.m. and the full menu is available until 3 p.m. The Mitsitam Cafe recently expanded with the addition of the Mitsitam Espresso Coffee Bar, which serves pastries and casual fare from the cafe’s repertoire along with Tribal Grounds Coffee—organic, fair-trade coffee grown by indigenous farmers and imported, roasted and provided to the museum by members of the Eastern Band of Cherokee of North Carolina. The Roanoke Museum Store on the second floor offers a wide variety of crafts, books, music recordings, souvenirs and toys. From the southern Algonquian language, “Roanoke” refers to the white shell beads that some East Coast tribes used for exchange and formal communication. Store merchandise includes items such as Navajo alabaster sculptures, Peruvian pottery, original Pendleton items (blankets and tote bags), Inuit sculptures, textile weavings made by the Mapuche of Chile and Zuni fetishes. The store also features Yup’ik ivory carvings from Alaska, Navajo rugs, Northwest Coast carvings and textiles, Lakota dolls, Cheyenne beaded necklaces, and silver and turquoise jewelry. The Chesapeake Gallery Store is on the first floor and offers an array of Navajo fine jewelry and gifts. Groups of 10 or more may schedule an entry time for admission through the reservations office via the education office: (202) 633-6644 or (888) 618-0572 or e-mail NMAI-GroupReservations@si.edu. For additional information about the museum, visit www.AmericanIndian.si.edu. To join the conversation, follow the museum’s Twitter and Instagram feeds, @SmithsonianNMAI.